Made of superior quality, 18K white gold plated over sterling silver, this delicate Infinity Love Symbol Pendant necklace with 20" Singpore chain will never let you down. Blue Sapphire Swaroviski Element September Birthstone jewelry Carefully crafted and made to last, this necklace promises to uplift every outfit adding a touch of refined elegance to your look. Click Add to Cart Now Before They're Gone. ❤️ QUALITY COMES FIRST ❤️ Elegent Infinity design charm with Blue Sapphire Swarovski and simulated diamond sparkle side stones. 18K white gold plated over sterling silver pendant and 18" + 2" necklace adjustable chain. ❤️ GIFT IDEAL FOR HER ❤️ Comes in fine jewelry navy blue gift box. Perfect gift ideals for mom, wife, daughter,sisters, love family, best friends or any lady you loved for their Birthday, Anniversary, Christmas, Valentines Day, Wedding, Engagement any celebration or just treat yourself. 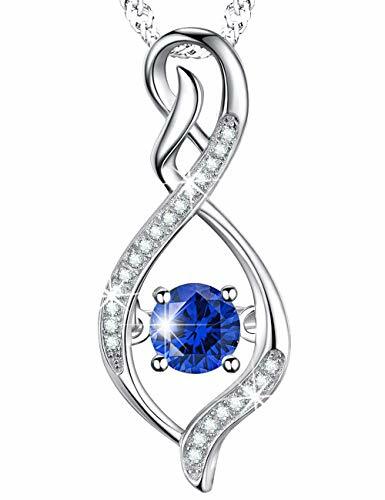 ❤️ A BEAUTIFUL PIECE ❤️ September Birthstone Jewelry in elegant Infinity design and shining effect of this exceptional pendant make it the perfect gifts choice for any occasion in the unique and fashion design. ❤️ STAND OUT IN STYLE ❤️ The exquisite white gold plated sterling silver and the unique infinity design make it an elegant addition to the jewelry collection of any woman, who wants to stand out with her own, unique, luxurious style! ❤️ STELLAR CUSTOMER SERVICE ❤️ Elda & Co offers you a LIFETIME WARRANTY in case you encounter any problem with your new jewelry. With nothing to worry about, order for you or your beloved ones today! 100% satisfaction and money back guarantee. Just be happy to add this beautiful necklace to your jewelry collection. Sterling Silver Heart Lab-created Sapphire Pendant with Diamond Pendant Necklace, 18"